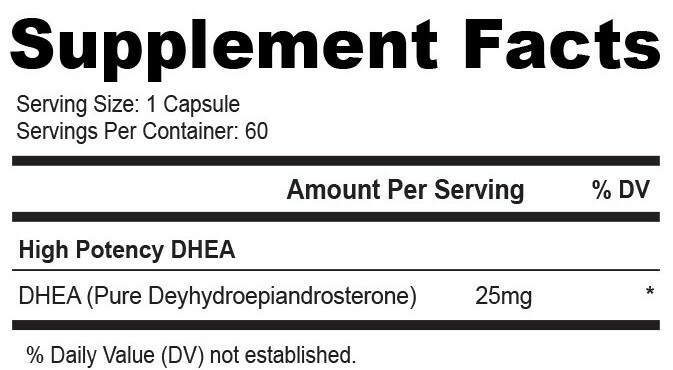 DHEA is a natural precursor of testosterone and estrogen that promotes a wide range of benefits for both men and women. Supplying and balancing these hormones is an essential part of staying healthy and vibrant as the aging process takes its course. With sufficient amounts of the necessary hormones, users will experience a boost in energy levels, an increase in sexual performance, enhanced mental clarity, less stress and more. Vivid Nutrition High Potency DHEA is formulated using only pure, premium quality DHEA, making it the most absorbable formula available. Produced in GMP certified facilities to pharmaceutical standards, Vivid Nutrition DHEA is the leading formula in terms quality and effectiveness. Take 1 capsule daily after breakfast with a full glass of water.